When it comes to food, I LOVE pasta. I also happen to LOVE bacon and also LOVE cheese. Why not make a meal that has all three ingredients. 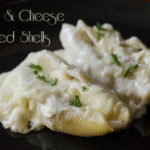 Below is a recipe for our Bacon & Cheese Stuffed Shells that you might also enjoy! In a large bowl add Ricotta 1/2 of the cream cheese and mix until blended. Add 1 cup of cheese mix, 1 tbsp parsley, bacon, garlic salt and pepper and mix well. 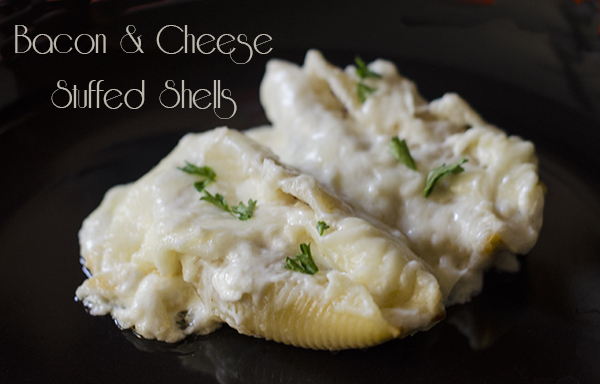 Spoon mixture into cooked shells and place in a non-stick 13x9 baking dish. In a large saucepan melt butter. Add flour and mix until smooth. Gradually add the whipping cream, both and milk. Bring mixture to a boil, reduce heat to medium high and cook for 1-2 minutes until mixture has thickened. Add remaining cheese mix, remaining cream cheese and remaining parsley. Pour mixture over shells. Sprinkle top with mozzarella cheese. Cover with foil and bake at 350 degrees for 30 minutes. Remove foil and bake an additional 10-15 minutes or until bubbly.